(CNN) -- Three major earthquakes struck within an hour and 10 minutes Thursday morning near Vanuatu in the South Pacific, prompting a tsunami warning that was quickly lifted. 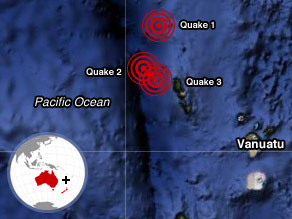 Thursday's quakes struck near Vanuatu in the South Pacific. They were part of series of nine moderate-to-major quakes that rattled the region in just over four hours. The first quake, with a magnitude of 7.8, struck at 9:03 a.m. (6:03 p.m. ET) at a depth of 35 km (22 miles) and an epicenter 295 km (180 miles) north-northwest of Luganville, Espiritu Santo, Vanuatu, the U.S. Geological Survey said. A second quake, with a magnitude of 7.7, struck 15 minutes later at the same depth and an epicenter of 340 km (210 miles) north-northwest of Luganville. The third quake, with a magnitude of 7.1, struck at 10:13 a.m. (7:13 p.m. ET) at about the same depth and an epicenter of 280 km (175 miles) north-northwest of Luganville. The Pacific Tsunami Warning Center issued and then quickly lifted a regional tsunami warning and watch for parts of the Pacific near the first earthquake's epicenter. A second pulse of the wave was 10 centimeters (3.9 inches), he said. "It looks like a very small wave," he told CNN in a telephone interview. There were no immediate reports of damage or injuries, Sardina said. The two major quakes that followed the first one were aftershocks, Sardina said. When there's a big quake, the pattern they follow is after the first quake, a second and then a third," he said. "Those are obviously related," he said. At the Hotel Le Paris in Noumea, the capital of New Caledonia, the manager told CNN that she felt the shake but had not seen any damage. On Espiritu Santo Island in Vanuatu, dive-shop owner Rehan Syed said he was aware of no reports of damages or injuries. "We have the sun out and winds are pretty normal," he told CNN. "Pretty cloudy skies but nothing more than that." "We felt the quake (my chair and my keyboard moved) but did not take too much notice as we live with shakes every week," said John Nicholls of Vanuatu Hotels in an e-mail. At the New Caledonia Hotel, guests were evacuated to higher ground, General Manager Torani George told CNN, adding that he had felt "nothing, nothing at all." "There is no panic, nothing," he said. CNN's Lonzo Cook and Jessica Jordan contributed to this story.